The Office for the Surveillance of the Political Parties and Political Movements will award a fine to Olympia Publishing House for billboards promoting the book “We Can Govern ourselves” to President Milos Zeman. According to the Office, it was an unannounced part of Zeman’s electoral campaign, according to the Respekt web site. 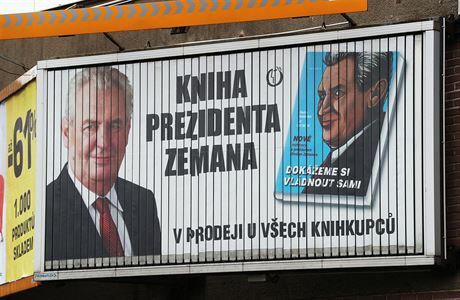 The book of interviews with Miloš Zeman was written by Radim Panenka and the spokesperson of the castle, Jiří Ovčáček, the publisher promoting it on billboards. According to the Office, he was unlawful because he did not register with the office as the third person to run a campaign in favor of one of the candidates, and the billboards did not even mark it. Both obligations arise from the law, just as the campaign definition itself. The publisher declined to tell the weekly the exact amount it provided for billboard advertising and posters. According to the site, the Office now has a final order on the table for a fine ranging from 30,000 to 50,000 crowns. However, the Office may not be able to send and post before the end of the second round of the presidential election that will take place this Friday and Saturday. He has to wait for the result of monitoring, according to the law, during which the supplier sets the exact number of billboards and other advertisements related to the case.